With two thirds of the world’s population projected to live in urban areas by the middle of this century, the accelerating pace of urbanisation generates crucial opportunities and challenges for sustainable development that reach far beyond city boundaries. Many global processes have recognised the importance of urbanisation as well as the roles and responsibilities of national governments vis-à-vis other urban stakeholders. For instance, urban issues are well articulated in the Agenda 2030, the New Urban Agenda and the Paris Agreement on Climate Change. National urban policies have been identified as being instrumental for governments to coordinate and articulate these global agendas and their own path to sustainable urban development. Global State of National Urban Policy is a first attempt to assess the status of national urban policy development in 150 countries. In the report you will understand why, how and in what forms NUPs have been developed,implemented and monitored globally. The report sets a solid foundation for a common methodology to monitor the progress of NUPs at the global level. 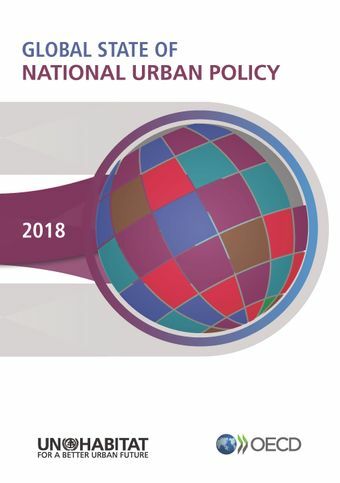 Further, it outlines how many countries have an explicit NUP, the focus of the policy in each country, the existence or not of a dedicated urban agency or department, and the capacity available for effective policy making. The report is also a significant contribution to the monitoring and implementation of the New Urban Agenda and the Sustainable Development Goals. In it, policy makers, practitioners and academia will find valuable resources and comparisons to inspire more evidence-based urban policy making for sustainable urban development. This work is a joint effort between UN-Habitat and the Organisation for Economic Cooperation and Development, and supported by the Royal Melbourne Institute of Technology. It is considered to be an important outcome of the National Urban Policy Programme, a global initiative launched by UN-Habitat, OECD and Cities Alliance at the Habitat III Conference in October 2016.